A 14-year-old boy is in a critical condition in hospital and a 17-year-old has suffered "life-changing" injuries in a double shooting in east London. 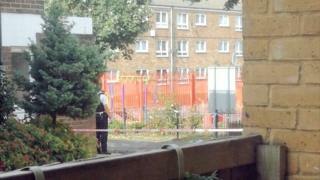 Police were called on Monday afternoon to Moore Walk, Forest Gate, and found the two teenagers with gunshot wounds. The Metropolitan Police said there were "serious concerns" of retaliation and put extra officers on the streets. Inquiries are continuing. No arrests have been made. The Met said the boys were taken to an east London hospital. Ch Supt Ade Adelekan said: "Sadly today two young men have been shot on our streets, one of whom remains critically ill in hospital. "We are only too well aware that this incident comes after a number of shootings and firearms discharges that are blighting our communities and seriously injuring our young men. "Tonight [Monday] there will be extra officers on duty throughout our borough, and due to my serious concerns that others may retaliate in response to today's incident, I will be authorising my officers to use stop and search throughout the borough under Section 60." Met Police figures published in April revealed a 42% spike in gun offences in the capital in the last year - up to 2,544 compared with 1,793 between April 2015 and 2016. Ch Supt Adelekan added: "Violence has no place on our streets, and we have already made four arrests in connection with recent firearms offences. "I want the community of Newham to help us tackle this - if you have any information about people carrying or supplying firearms please let us know and we will take action."